The X-CUT S93G chain is especially suited for demanding consumers and everyday professional use. 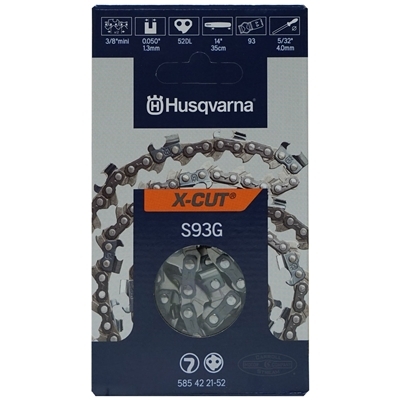 The cutters working corner is cut at a unique, rounded sharp angle for longer lasting sharpness and minimal maintenance. With outstanding durability, low stretch, a high cutting efficiency and a sharpness that lasts, it's made to perform better than ever. Sharpens with a 5/32" round file or 1/8" grinding wheel.